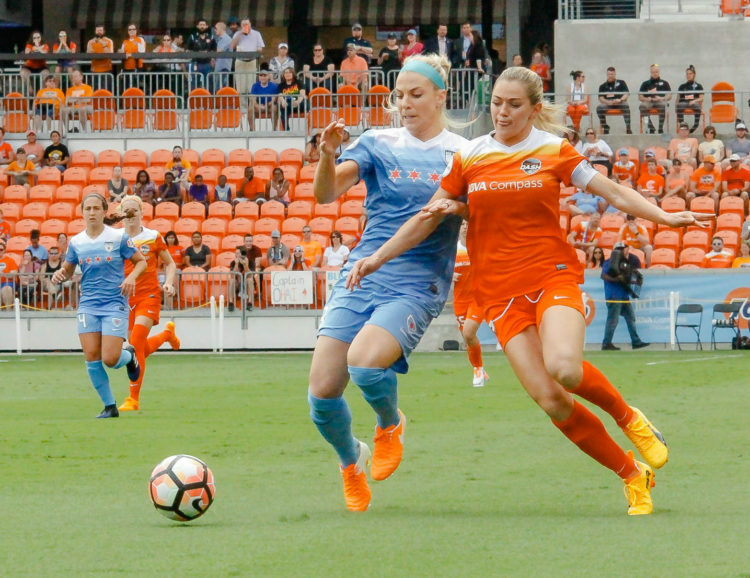 The Houston Dash sends a message on its season opener against the Chicago Red Stars at BBVA Compass Stadium Saturday evening. Houston forward, Kealia Ohai, had a strong start and scored the first goal of the game on the 15th minute with an assist from Brooks. “I think it’s really important that Kea gets off to a good, quick start this season and not struggle early so we can kind build on that momentum,” Dash head coach Randy Waldrum said. Although, the Red Stars weren’t going to take it lightly. Chicago’s forward, Kristen Press put pressure on Houston by attempting to score at the end of the first half. Press’s efforts came up short to put a goal past Houston’s goal keeper, Lynda Williams. During the second half, all eyes were on Houston’s Rachel Daly. On the 80th minute, Daly swiftly avoided Chicago’s defense and made a perfect left-foot curl in the upper corner to score the Dash’s second goal of the game. Houston wound up winning the game with a, 2-0 shut-out, against Chicago. Daly and Ohai shared a memorable celebration, highlighting the winning goal. “Kea are very competitive and we were on the same team and I don’t know why, we won and were really crazy about the possession game and just decided to do a softball pitch,” Daly said. Despite not having their key player, Morgan Brian – who is out due to an MCL sprain – this is Houston’s third consecutive opening day win in their home stadium. Next Saturday, April 22nd; the Dash are set to travel to Memorial Stadium and face Seattle Reign. “It’s one game, and we know that, but now we’ve got to prove that we can start putting some things together in a row and that’s the next big hurdle for us,” Waldrum said.